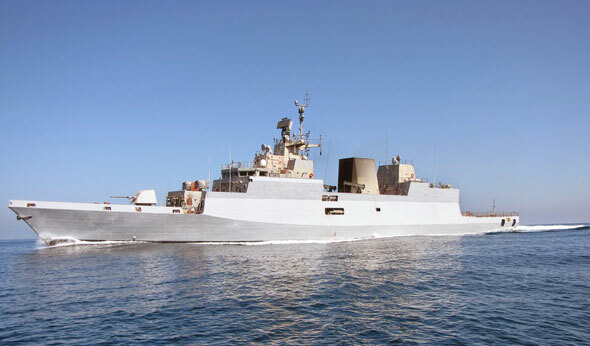 Defence Minister Arun Jaitley will commission the first indigenous P28 anti-submarine warfare corvette Kamorta into the Indian Navy on August 23 in Visakhapatnam. 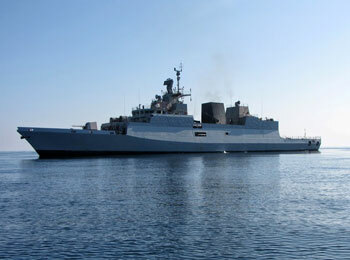 Named after the erstwhile Petya Class ship from USSR ex-Kamorta (21 Nov 1968 - 31 Oct 1991), the new Kamorta has been indigenously conceived and designed by the Navy's Directorate Of Naval Design and constructed at GRSE, Kolkata at a cost Rs 7852.39 crore for all four ships in the class. 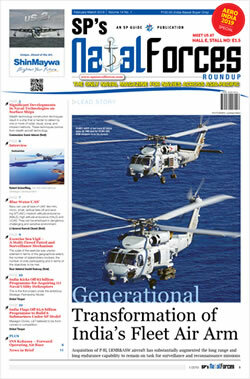 The Navy believes it "bears testimony to the Indian Navy’s prowess in designing state-of-the-art naval combatants, comparable to the best in the world." Stealth features on the Kamorta-class include an X-form hull for low radar cross section, a raft-mounted gearbox for low under water noise and infrared signature suppression device for low heat radiations. 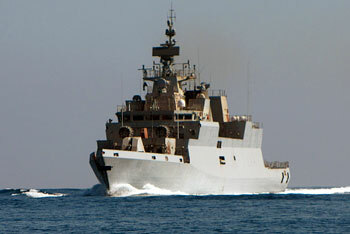 The ship uses DMR 249A steel for construction, developed indigenously by Defence Material Research Laboratory (DMRL) and manufactured in-house by the Steel Authority of India Ltd. The ship sports a carbon fibre reinforced plastic (CFRP) superstructure integrated with the steel hull in the third and fourth ships of the class. The Kamorta will see the first time installation of three revolutionary parts: foldable hangar door, railless helo traversing system and telescopic boat davit. 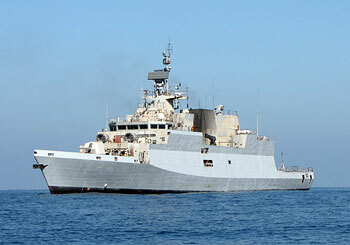 Highlights of the indigenous design include low observability throughout the full beam superstructure, inclined ship sides and reduced Infra red signature through cooling of the engine and diesel alternator exhausts — developed indigenously by Naval Scientific and technical Laboratory (NSTL). The Kamorta also sports a 'Combination of Diesel and Diesel (CODAD)’ propulsion system with the two diesel engine along with one gear box on each shaft. The ship is fitted with indigenous state-of-the-art weapons and sensors, including a medium range gun from Bharat Heavy Electrical Ltd, torpedo tube launchers as well as anti-submarine rocket launchers from Larsen & Tubro, close-in weapon system and chaff system. The ship is equipped with a bow mounted sonar and is capable of deploying a Sea King 42B helicopter from its aft deck. Modular accommodation, gallery and vacuum sanitation system have also been introduced for high standard of crew habitability. Total Atmospheric control system for effective heat ventilation and air conditioning. Integrated Platform Management System (IPMS) which include Integrated Bridge System as well as Battle Damage System for effective modern warfare. 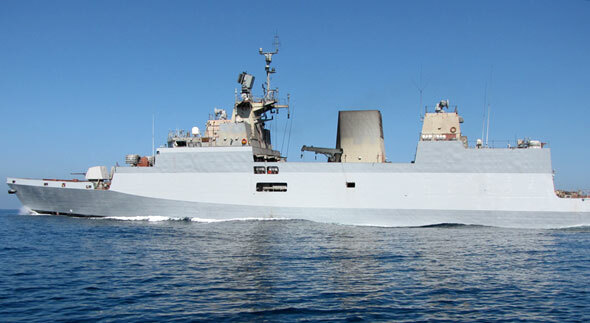 The Kamorta will be operated by a complement of 13 officers and 176 sailors. An active towed array sonar will be integrated shortly. 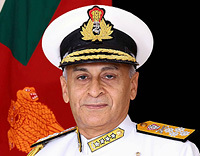 The ship was delivered to the Indian Navy on 12 July 2014, and will form part of the Eastern Fleet under the Eastern Naval Command.